How Japan Learned About "Nuclear Safety"
Dr. Wittner is Professor of History emeritus at the State University of New York/Albany. 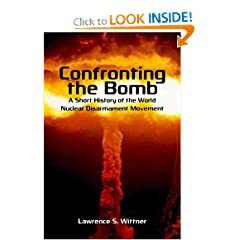 His latest book is Confronting the Bomb: A Short History of the World Nuclear Disarmament Movement (Stanford University Press). Although people can be educated in a variety of ways, experience is a particularly effective teacher. Consider the Japanese, who today are certainly learning how dangerous nuclear power can be. Of course, the Japanese people also have had a disastrous experience with nuclear weapons—not only in 1945, when the U.S. government destroyed Hiroshima and Nagasaki with atomic bombs, but in 1954, when a U.S. government H-bomb test showered a Japanese fishing boat, the Lucky Dragon, with deadly radioactive fallout, and a vast nuclear disarmament movement began. The Lucky Dragon incident occurred in the context of the first U.S. H-bomb test, conducted by the U.S. Atomic Energy Commission (AEC) in March 1954. The AEC had staked out a danger zone of some 50,000 square miles (an area roughly the size of New England) around Bikini atoll, the test site in the Marshall Islands, which the United States governed as a UN "trust territory." But the blast proved more than twice as powerful as expected, and sent vast quantities of radioactive debris aloft into the atmosphere. When large doses of this nuclear fallout descended on four inhabited islands in the Marshall chain (all outside the official danger zone), the U.S. government evacuated U.S. weather station personnel and, days later, hundreds of Marshall Islanders. The islanders quickly developed low blood counts, skin lesions, hemorrhages under the skin, and loss of hair. Eventually, many came down with radiation-linked illnesses, including thyroid cancer and leukemia. Meanwhile, about 85 miles from the test site—and also outside the danger zone—radioactive ash from the H-bomb test fell on a small Japanese fishing boat, the Lucky Dragon. Two weeks later, when the vessel had reached its home port of Yaizu, the crew members had become seriously ill, with skin irritations, burns, nausea, loss of hair, and other radiation-linked afflictions. In short order, the Japanese government hospitalized the stricken fishermen and destroyed their radioactive cargo. Although most of the fishermen survived, the Lucky Dragon's radio operator, Aikichi Kuboyama, died during hospital treatment. As the news of the Lucky Dragon incident spread throughout Japan, a panic gripped the nation, as well as a fierce determination to end the victimization of people, in Japan and the world, through nuclear weapons. Nuclear fallout—or, as the Japanese referred to it, "the ashes of death"—became a household term. A poll found that only two percent of the population approved of nuclear testing unconditionally. In May 1954, a group of middle class housewives in the Suginami ward in Tokyo began a petition campaign to ban H-bombs. Carried in their shopping baskets, this "Suginami Appeal" grew into a nationwide movement and, by 1955, had attracted the signatures of 32 million people—about a third of the Japanese population. Japan's nuclear disarmament campaign blossomed into the largest, most powerful social movement in that nation's history. Polls showed overwhelming popular support for it. Naturally, this upsurge of "ban the bomb" sentiment shocked U.S. government officials, who—with their nuclear weapons program at stake—engaged in a systematic policy of denial. The chair of the AEC, Lewis Strauss, publicly declared that the Marshall Islanders were "well and happy." The Japanese fishermen, he conceded, had experienced a few minor problems; but, in any case, he stated falsely, they "must have been well within the danger area." Privately, he was more caustic. The Lucky Dragon, he told the White House press secretary, was really a "Red spy outfit," a component of a "Russian espionage system." At the request of Strauss, the CIA investigated this possibility and categorically denied it. Nonetheless, Strauss continued to maintain that the irradiation of the Lucky Dragon "was no accident," for the captain of the vessel must have been "in the employ of the Russians." He also told authors to ignore the contention of the "propagandists" that a crew member of the vessel had died of radiation exposure. Other American officials, too, saw no justification for the Japanese response to the Lucky Dragon incident. From Japan, the U.S. ambassador lamented that nation's "uncontrolled masochism." He reported that Japan, "aided by [an] unscrupulous press, seemed to revel in [its] fancied martyrdom." According to Secretary of State John Foster Dulles, President Dwight Eisenhower found this message "of great interest and value from [the] standpoint of policy formulation." Like Strauss, Eisenhower insisted in his memoirs that the fishermen were within the danger zone. Commenting on the effects of the Lucky Dragon incident, the acting secretary of state added his own warnings about public attitudes in Japan. "The Japanese are pathologically sensitive about nuclear weapons," he told Eisenhower. "They feel they are the chosen victims." In reality, most Japanese had learned from the tragic events of 1954 that, when it came to nuclear arms, everyone was a potential victim. Or, to put it another way, there are no safe nuclear weapons. But many Japanese continued to cling to a belief in safe nuclear energy—at least until this month, when their crippled nuclear reactors began spewing out radioactivity and heading toward a meltdown. Plenty of people in other countries, including the United States, remain in denial about the safety of nuclear weapons and nuclear power. What kind of experience will it take to convince them to rid the world of these monstrous things? More to the point, is it really necessary to wait for that experience to occur? The Lucky Dragon #5 (Daigo Fukury&#363; Maru) incident caused a media sensation in Japan. That notoriety influenced Toho producer Tomoyuki Tanaka to tailor the opening scene of the giant monster movie &#12468;&#12472;&#12521; (GOJIRA), known in the U.S.A. as GODZILLA, to exploit the opportunity of that wave of publicity. While the Lucky Dragon #5 incident is virtually unknown in the U.S.A., it spawned a household name in a fictional character "Godzilla" that symbolized the terrible effects of nuclear weapons on civilian population.